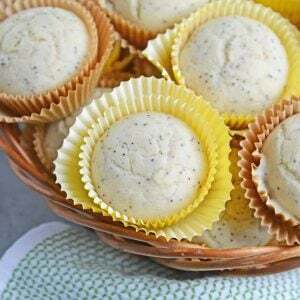 Lemon Poppy Seed Muffins are a quick and easy muffin recipe that can be made in 30 minutes. Carbonated lemon water is the secret ingredient to make them super fluffy! Preheat oven to 375 degrees. Line muffins tins with liners and then lightly coat each liner with cooking spray. Combine all ingredients in a stand mixer fitted with the paddle attachment or large mixing bowl. Mix until just blended. Do NOT over mix. Mixture will be slightly lumpy. Fill the muffin cups 3/4 full. B for 14-18 minutes or until tops spring back when lightly touched. Muffins will NOT brown. Remove before this happens.